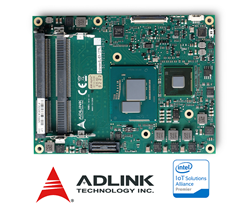 ADLINK Technology, a leading global provider of embedded and industrial cloud-based services, intelligent gateways, and embedded building blocks for edge devices that enable the Internet of Things (IoT), will offer its first COM Express® Basic Size Type 6 module incorporating the latest Intel® Xeon® E3-1200 processor and Intel® Core™ i7 processor (formerly codenamed “Broadwell”) with Intel® QM87 Chipset. Featuring improved graphics and processing performance compared to previous generation processors, the Express-BL is ideally suited for carrier-grade edge device solutions that demand intense graphics performance and multitasking capabilities in a space-constrained environment, such as industrial cloud and media servers performing real-time video transcoding for content delivery networks (CDNs), network functions virtualization (NFV), and medical imaging applications. Video-on-demand streaming services can leverage the transcoding capabilities of the Express-BL for on-the-fly compression of video streams to reduce data transfer costs and provide users with the best resolution for their viewing devices (e.g. 240p, 360p, 480p, 720p, 1080p). Intel® Media SDK and OpenCL provide system developers with the necessary tools to implement these streaming solutions. In ultra-high resolution ultrasound systems requiring intensive 3D imaging calculations, the Express-BL can utilize its integrated GPU as a coprocessor with the use of an OpenCL software layer. The Intel® Xeon® processor with Iris™ Pro Graphics 6300 feature set avoids the need for a discrete coprocessor, reducing complexity and cost. The ADLINK Express-B L supports up to 32GB of dual channel DDR3L memory at 1600MHz and features Intel® Iris Pro Graphics 6300 integrated in the processor (dependent on the processor selected). The module provides three DDI channels, as well as LVDS and VGA display outputs, enabling it to support up to three independent displays at 4K resolution and drive multiple HD screens without the need for a discrete graphics card. In addition, Embedded DisplayPort (eDP) is optionally available to support next generation displays. The Express-BL also provides rich, high-bandwidth I/O, including one PCI Express x16, seven PCI Express x1, Gigabit Ethernet, four SATA 6 Gb/s, four USB 3.0 and four USB 2.0. A wide range of operating systems is supported, including Linux, Windows 7 and 8.1 Update, Windows Embedded Standard 7, Windows Embedded 8.1 Industry and VxWorks. In addition, the Express-BL is available in an Extreme Rugged™ version featuring an operating temperature range of -40°C to +85°C. The Express-BL is equipped with ADLINK’s Smart Embedded Management Agent (SEMA) to provide access to detailed system activities at the device level, including temperature, voltage, power consumption and other key information, and allow operators to identify inefficiencies and malfunctions in real-time, thus preventing failures and minimizing downtime. ADLINK's SEMA-equipped devices connect seamlessly to our SEMA Cloud solution to enable remote monitoring, autonomous status analysis, custom data collection and initiation of appropriate actions. All collected data, including sensor measurements and management commands, are available from any place, at any time via encrypted data connection. For more information on the Express-BL, please visit our website at http://www.adlinktech.com. Intel, Xeon, and Core are registered trademarks of Intel Corporation in the United States and other countries. All other trademarks are the property of their respective owners.